ST 1502 was the third craft of the third batch of this type to have been built by BPB as their Yard No. 1888. The craft was taken on charge by the RAF on 24.03.42 and immediately despatched to be used by 51 Air Sea Rescue Unit (AS RU) under control of Coastal Command at Penrhos and Pwllheli in Wales. The tender remained based at the unit for virtually all of her WWII service before being transferred to No 56 ASRU based at Portaferry. The allocation was recorded as 30.05.45, however ST 1502 was not received at her new base until July the same year. Within a few months the craft was on the move to be based at Alness, in Scotland, still with Coastal Command. This allocation was dated 18.10.45 and the craft recorded as received at Alness in November 1945. Post war the ASRU's were deactivated and replaced by Marine Craft Units (MCU). Thus ST 1502 was allocated to 1100 MCU on 23 .08.46 which was based at Invergordon. In line with RAF policy at that time, most surviving wartime built seaplane tenders were "converted" or had a role change and were thus redesignated as Range Safety Launches. Several of the original Mid craft including ST 1502 were upgraded to MkIA specification in the early 1950's. ST 1502 was taken in hand at 238 Maintenance Unit (MU), Calshot on 17.5.50 for conversion on authority dated 14.2.50 (A73418). On completion RSL 1502 was returned to be based at Invergordon/Alness until she became surplus at the end of 1955. 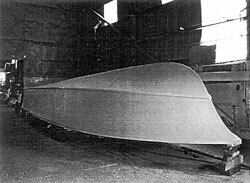 The craft was stricken off charge by the RAF on 31.12.55 and subsequently offered for disposal as lying at the RAF base at Calshot. RSL 1502 was advertised for sale in the February 1956 edition of Motor Boat & Yachting and was subsequently sold. Thereafter she had several owners and was given the name of SINCLAIR. Her full movements are not known, however she was offered for sale again in April 1992, then lying in Brentford, Middlesex, where she remained until 1995 (see photo above), and was subsequently located at Acaster, near York in August 1997. 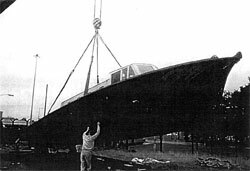 The craft was donated to the BMPT by her then owner Dave Wright and was brought by low loader to Marchwood arriving at the site on 24.09.99. By the end of that year she was one of two major projects underway for restoration by the trust and by Spring the following year had been "taken in hand" and the hull stripped down to a skeleton. Within a year work progressed well, - she was re-decked, a new wheelhouse and cabin superstructure were fabricated and were on show during May 2000 - and the team of enthusiasts from the Hants & Dorset Branch of the ASRJMCS Club had formed a smaller RAP 5T1502 Restoration Group, working on the craft under the umbrella and guidance of the BMPT. 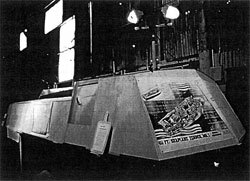 There were also some delays in obtaining first funds and then the sand to continue the grit blasting, but with this completed the hull was glassed over, turned and the cabin and the superstructure fitted. The Restoration Group hope to have the craft in the water very soon.